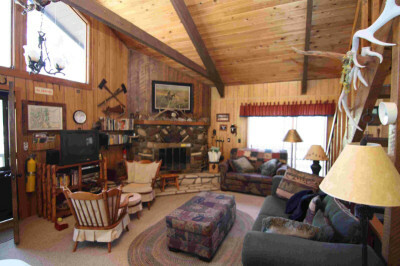 The cabin is situated on the Eastern slope of Mt. 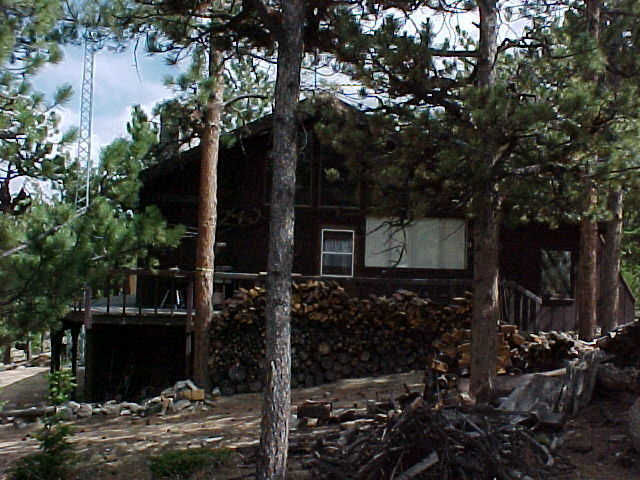 Princeton at approximately 9,000-ft. elevation, within a development of vacation homes and permanent residences called "Lost Creek". The chalet architecture blends perfectly into the idyllic mountain setting. As you make the drive on an all weather road from Buena Vista to the cabin, you are likely to see elk, deer, antelope and birds of prey. 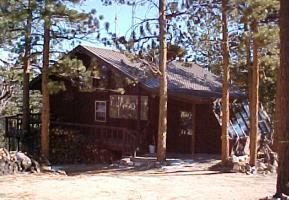 The cabin offers 4 bedrooms, with a total of 5 double beds, three bathrooms, plus a loft for the kids. Everything you need is there - just stock the refrigerator and cupboards for your stay. Buena Vista has a large grocery store and good restaurants. The living room is the perfect place for reading and reflection. A color TV and DVD player are also there to enjoy between books. The massive native rock fireplace was enhanced with marble from Marble, CO. A wood stove will add some quick warmth on a cool night. Click photo for a larger picture. 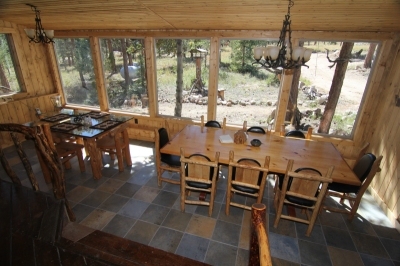 The kitchen has a microwave/range/oven as well as refrigerator. The sun room doubles as the dining area, which seats 12, and is the observation room for the many birds and animals that visit the lot. There is a phone at the cabin, and you may request the number when booking. Your cell phone may or may not work in Buena Vista. Main Level: Living room, kitchen, sunroom with dining area, master bedroom with full bath, second bedroom, and a separate 3/4 bath. Loft: Ham shack, plus two single beds. Lower level: 2 bedrooms, 3/4 bath, laundry room, and workshop. Winter heat is provided by gas forced-air furnace. 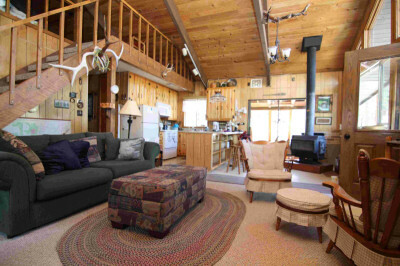 And, if you prefer, there is a wood stove to provide the true ambiance of a mountain cabin. The wood pile is always well stocked.